What Makes This Matzo Different From All the Other Matzos? 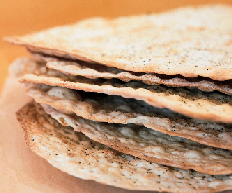 Forget those commercially produced perforated sheets that pass for matzo. Breadline’s are artisanally baked, resulting in a puffy, oblong cracker that tastes a little liked a sophisticated baguette. Photograph by Allison Dinner. No kidding. The commercially produced perforated sheets found in grocery stores in the weeks leading up to the holiday are as dry and tasteless as cardboard. But there is an alternative: the oversize, oblong sheets at Breadline. What makes this matzo different from all other matzos? To start with, it’s produced by an artisanal baker. Miguel Torres, who has headed baking operations for nine years, includes a shot of olive oil in the dough, then dusts the finished sheets with poppy seeds and coarse salt. The result is a crackerlike product with puffy air bubbles and an aftertaste similar to that of a sophisticated baguette. Forget those heaps of cream cheese or butter—this matzo can stand alone. The sheets are $8 a pound, and for the eight days of Passover, they sell like hotcakes. Order several days in advance or risk losing out. Torres bakes fresh batches every morning of the holiday, taking much more time with his matzos than the rushed children of Israel did with theirs. Breadline, 1750 Pennsylvania Ave., NW; 202-822-8900; thebreadlinedc.blogspot.com.